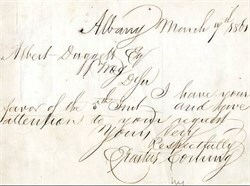 Handwritten note from Erastus Corning to Albert Duggett. Erastus Corning (1794-1872), American capitalist, was born in. Norwich, Connecticut, on the I4th of December 1794. In 1807 he became a clerk in a hardware store at Troy, New York, but in 1814 he removed to Albany, where he eventually became the owner of extensive ironworks, obtained a controlling interest in various banking institutions, and accumulated a large fortune. He was prominently connected with the early history of railway development in New York, became president of the Utica & Schenectady line, and was the principal factor in the extension and consolidation of the various independent lines that formed the New York Central system, of which he was president from 1853 to 1865. He was alsO interested in the building of the Michigan Central and the Chicago, Burlington & Quincy railways, and was president of the company which constructed the Sault Sainte Marie ship canal, providing a navigable waterway between Lakes Huron. and Superior. He was prominent in politics as a Democrat, and, after serving as mayor of Albany from 1834 to 1837, and as state senator from 1842 to 1845, he was a representative in Congress in 1857-1859 and in 1861-1863, being re-elected for a third term in 1862, but resigning before the opening of the session. In 1861 he was a delegate to the Peace Congress, but when the Civil War actually began he loyally supported the Lincoln administration. He was a delegate to the New York constitutional convention of 1867, and was for many years vice-chancellor of the board of regents of the University of the State of New York. He died at Albany, New York, on the 9th of April 872.